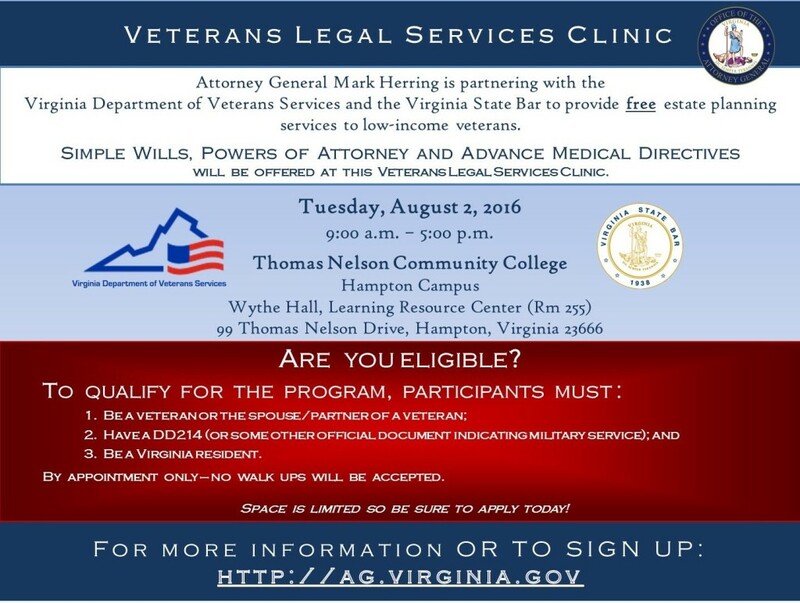 Attorney General Mark Herring is partnering with the Virginia Department of Veterans Services and the Virginia State Bar to provide free estate planning services to veterans. Simple Wills, Powers of Attorney and Advance Medical Directives will be offered. This clinic will occur on Tuesday, August 2 (9am to 5pm) at Thomas Nelson Community College, Hampton Campus, Wythe Hall, Learning Resource Center (Room 255), 99 Thomas Nelson Drive, Hampton, VA 23666. For further details, registration and eligibility criteria see the attached flyer. To register today click here. Space is limited and veterans will be seen by appointment only.